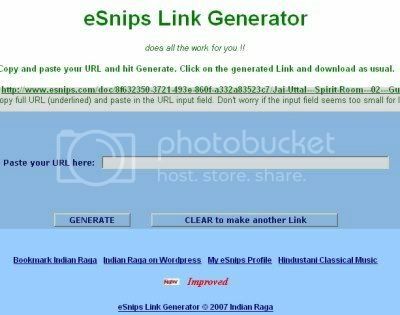 Now that eSnips keeps on evolving new methods to prevent users from downloading, users’ frustration is surmounting with each day. A few days back they changed their default music player and when I made small modifications to my eSnips Downloader it stopped working with Firefox. Internet Explorer users were spared though. As I am trying to keep pace with eSnips with every step they take, I have tried yet again to modify the code of the Downloader. This time it would be anonymous downloading through a proxy server. This is not a permanent solution though but as I said before, I am keeping pace with eSnips everday and every time. 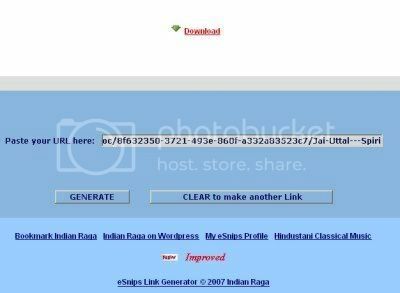 Step One : Generate your link as before and click on the generated link. Step Two : Depending upon the security settings of Internet Explorer – it’s a small piece of caution that you are about to download a file from some alien territory – right click on the message below the title bar of the Downloader and choose ‘download file’, or you may click the bold orange coloured link itself in the main window. Step Three : Save your file. With Firefox it’s lot easier. The first and the third steps are the same as in Internet Explorer. There is no warning of downloading an unkown file. I am not very sure if this will work forever. Why, it may stop working a few hours from now. As eSnips has changed it’s default music player from windows media player to a flash player, old download tricks have stopped working. Although the doc to nsdoc trick still works with downloaders like Flashget and Orbit (Grab++), it isn’t working when the URL is changed in the address bar of the browser itself and by pressing Enter. Only a blank page will appear when done so. But the bandwidth problem still persists. eSnips is not the same place as it used to be before. As for me, I have stopped uploading more to my music folders. Meanwhile continue downloading files from accounts that have no bandwidth problems (those with less visitors). This file is no longer available on eSnips! The maximum daily bandwidth for this account has been reached. Please try to download this file another day. The next day you will probably see the same message (I’ve been trying to download a file from an user’s folder for the last ten days and getting this same message again and again and everyday). I have not been able to find a way out for this problem till today…. but I’m trying. When you try to upload a music file (try recording a sound file of your own voice and uploading it) you invariably will be refused to upload it (publish it, as people at eSnips call it) citing copyright infringement laws, but only when the file has almost uploaded fully and not at the beginning when the upload starts. This could be very frustrating for many of us. Imagine an user uploading a 50 MB file and tearing his hair when he gets this message, only after the upload is almost done. However, there are ways to circumvent these glitches as eSnips is presumably using a software called ‘Audible Magic‘ which scans each music file for copyright fingerprints. However, even my not-so-techy mind knows, these fingerprints are embedded in the mp3 file in the form of ID3 tags either in beginning of the file or at the end of it. Try trimming the mp3 a few seconds at the beginning and a couple of seconds at the end, and if luck is on your side you may probably hoodwink the software in letting you upload. Well, my abnormally inquisitive mind told me that the file was there at eSnips allright, as even the file size was showing, so I just modified the ‘doc’ to ‘nsdoc’ in the address bar and pressed ‘Enter’. Lo and behold my file was ready for download. I am sure something is bugging eSnips which I fail to understand (maybe copyright authorities have tightened their noose around it). But why employ such methods to block files, which are so easy to exploit.